How do I apply my Iron-On Labels and Transfers? How do I make Iron-Ons? How do I apply my temporary tattoos? How do I create custom temporary tattoos? How do I create a custom label using templates? How do I make a custom logo sticker? How do I add text to my design? How do I change the size of my sticker? How do I change the shape of my sticker? How do I add an image to my design? How do I make individually cut stickers? How do I make clear stickers? How do I search and browse for images? Does StickerYou offer art and design services? How do I change the background on my custom design? What are the bleed and safe zones? How do I eliminate the white border around my sticker? How do I clear cookies and cache in my browser? What format of images can I upload? How can I set up my own art files for a custom order? What browsers does the Sticker Maker support? How do I adjust the size of my die-cut stickers? What is a front-side adhesive sticker? How do I check the resolution of my images? Why did my upload not work? What is a die-cut sticker? What is the Page Maker Classic? How do I adjust the number of stickers I order? How many stickers are on a sheet? Why do I need a StickerYou account? How do I get in touch with StickerYou? What is StickerYou's return policy? Is my order guaranteed to arrive by the Estimated Delivery Date? Can I cancel or make changes to my order after its been placed? How do I re-order previously purchased items? If the color of my stickers are different than what I ordered what can I do? How do I order stickers and other products? How is the price determined for orders? Why is my Credit Card not working? How do I use coupons and promotion codes? Why does my coupon code only cover part of my order? I got my order and it's soaked! Quick tip: Change the background of your image from white to transparent for a more accurate die-cut. 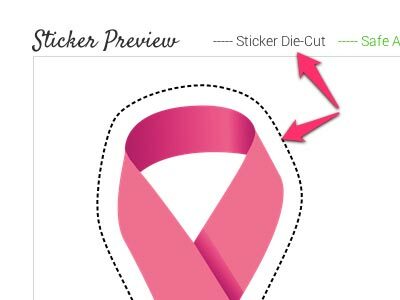 Note that the smaller you set your sticker size at, the more vague, or smoothed your die-cut will become. Not-so-quick-tip: We use an algorithm that maps out your entire image. It automatically calculates an appropriate die-cut line to follow the contour of your uploaded image. It looks for small changes in the colors of the pixels on the graphic. At smaller sizes, there are less pixels required to display your entire image. (inversely, likewise), at larger sizes, there are more. If even one of these tiny pixels is off white, the algorithm of the die-cut generator will see your image as two unique images, and respond by drawing a die-cut line to accommodate both - the most appropriate being a rectangle.